Engineers have worked overnight to clear a landslip on the rail line between Stirling and Dunblane. The line was blocked by around 20 tonnes of material after heavy rain caused a landslip at around 5.20pm on Wednesday. The landslip near Bridge of Allan forced the rail line to close for Wednesday evening. A spokesman for Network Rail said engineers had worked until around 4am on Thursday to clear the mud and rocks which had been washed on to the line. 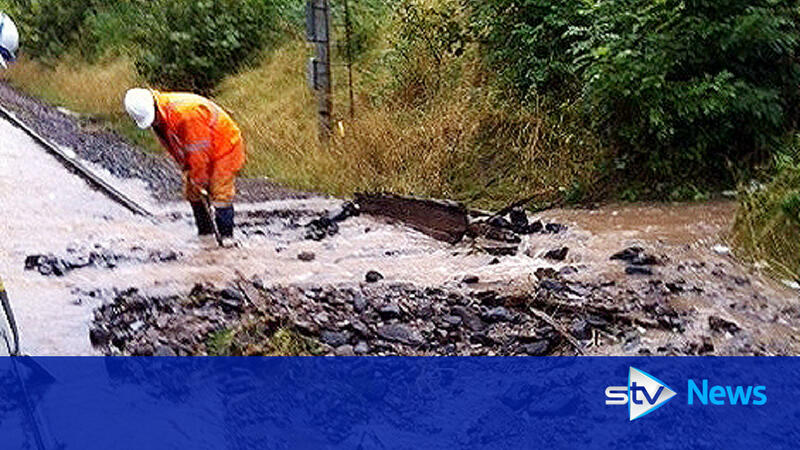 Around 20 tonnes of material caused a blockage on the rail line between Stirling and Dunblane. Looking north from Stirling Castle towards Bridge of Allan on 15 April 2008 with a container train about to pass through the station. Train 1Z25, the Great Britain II, heading for Inverness, nears Bridge of Allan in the early afternoon of 10 April 2009, behind Stanier Black 5s 45231 The Sherwood Forester and 45407 The Lancashire Fusilier. 4A11 the Grangemouth-Aberdeen freight approaches Bridge of Allan from the south. Stirling Castle is in the background on the left. In the foreground is stuff left from track maintenance.